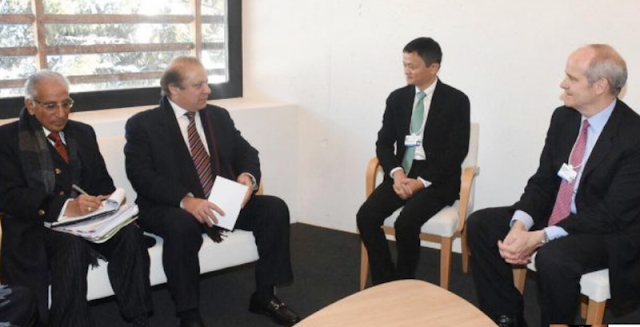 The chairman of Alibaba group, Jack Ma met the prime minister of Pakistan, in Davos, Switzerland, to discuss the potential investment in Pakistan, from the Alibaba group. The interest was indeed very concrete. The meeting was based upon the sidelines of the 2017 World Economic Forum. Jack Ma himself confirmed the interest, and stated that the interest was indeed solid, and also stated that Alibaba group had been closely following positive economic growth in Pakistan, leading to the meeting, and are ready to invest in building eCommerce platform. Jack Ma also had praise for the China-Pakistan Economic Corridor (CPEC), stating that they set a platform, which provided immense opportunities. The Pakistani prime minister, Nawaz Sharif also invited Jack Ma to visit Pakistan at the earliest opportunity, and while accepting, Jack Ma himself invited Mr. Nawaz Sharif to visit his company’s hub – Guangzhou. Jack Ma also provided a very interesting stat regarding his group, stating that that 60 million companies worldwide were only benefiting from their group at the moment. The prime minister also met with several other people, while attending the ongoing World Economic Forum (WEF) in Davos, Switzerland, many powerful people, including the group CEO of standard chartered bank global, and he also met the Sri Lankan prime minister, Mr. Ranil Wickremesinghe. These meetings with corporate leaders can be seen as an encouraging sign for the people of Pakistan because this can lead to greater investment opportunities in the country and hence more jobs.